Rumor Alert: DC vs Street Fighter and More! In other rumor news, there is some retro-themed Nintendo Wii hopes being floated around. First of all there is talk of a Castlevania game being developed for the Wii. Not sure what the chances are that it will have 2D gameplay even with the success of the DS games. Also, Play Nintendo is reporting that a “reputable source” seems to have provided them with a list of games for the Virtual Console that will be availible at launch. Personally, I’ve never seen Play Nintendo before this (but the link showed up on the front page of Digg), so I have my doubts on how authentic it is. Take this all with a grain of salt, but maybe it will help your daydreams for the day. I can tell the game is going to be excellent as always but I can’t agree with liking DC charachters more than the Marvel ones. Marvel characters are way cooler and way more diverse in size, speed and ability – there’s no chance that DC characters would look as awesome flying around the screen as Wolverine, Hulk, Blackheart and the rest of ’em did. The final bosses wouldn’t favorably compare either, I doubt. All this is EA’s fault…But it’s been too long since a new Capcom fighter so I’ll righteously take it…in the arcades, please. On the Virtual Console “list”…those are pathetically safe choices, and why are people getting so interested figuring it out anyway? I could tell you 95% of ’em, I’m sure of it. What I want to see is Starfox 2, Earthbound Zero and all those unreleased gems that you can only get on absurdly rare prototype game carts. As I understand it, Capcom Japan doesn’t have domain/rights over the SF Franchise anymore, that’s left to Capcom America. However, not that it matters, A DC vs. SF wouldn’t sell, DC isn’t as big there as Marvel is, and even the Vs. games were made to capitalize on the interest from the cartoons. It would be awesome, Shiva vs. Chun-li especially, Connor Hawke vs. Guile. DC has the coolest martial arts characters. Oh yeah! this would be a major blast of the DC super heroes against the Street Fighter in a Vs game. I definitely love the DC & Marvel characers. I can imagine this in my dreams, there would be no problem at all for this cause they already have the X-Men, Marvel, & Fatal Fury characters in a crossover with Street Fighter so I say the DC super heroes needs to join the party. I wouldn’t hold my breath waiting for this game to be developed at any point in the future-When they say the deal is still in the works or if there are still discussions, that’s short for the game won’t be released. Why? DC is under the control of beuracratic idiots at WB who have them under a very tight budget. This is the main reason why DC’s marketing is crappy compared to Marvel’s. It’s not that DC is less talented than Marvel, it’s just that they have less control of their own stuff than they do; Marvel has the advantage of being independently owned while DC has to answer to a higher power, who don’t always have their best interests at heart. Why do you think that Superman and Batman get more attention than the other characters at DC? It’s because they bring in more money than other characters. You all have to look at things from a business point of view. I would definately love to see this game released but as long as DC has to keep answering to WB, it won’t happen. DC needs to branch out on their own like Marvel did. 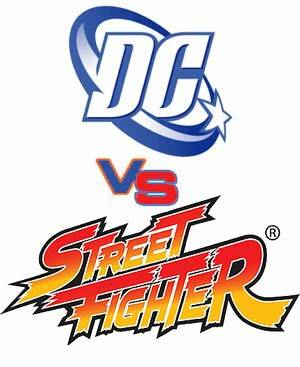 I like see Dc vs Street fighter very tight video game and cool too. Instead of doing a game like this they should do a King of Fighters vs. Street Fighter or Guilty Gear vs. Street Fighter.These games would suit this series more than DC,even if they do this game they better make this game 2d or side view 3d like the Street Fighter hd remix. Hd is a new way to start Mavel vs capcom.Time is growing towards adult gaming.